So you want to dress up as a whimsical creature from ancient mythology? And Greek at that? Well let us be the first to compliment you on your refined tastes. But please tell us you're not one of the typical costumers. That you're not dressing up as some love goddess, Greek maid, or the typical (boring) types. No? Good. We thought you might be a little more ambitious than that. After all, Greek mythology is rich, varied and has far more fascinating options for female roles than just the fluffy goddesses or Greek damsels in distress. What about the goddess of war? Or the goddess of the hunt? What about the Amazon warrior women, sirens, and dryads? They're Greek, mythological and have awesome powers! Better yet, what about the Gorgon sisters? Daughters of water deities, these ladies were dangerous, particularly Medusa. That woman had venomous snakes for hair and could petrify onlookers. Talk about exciting (and way better than some fluffy toga nonsense). 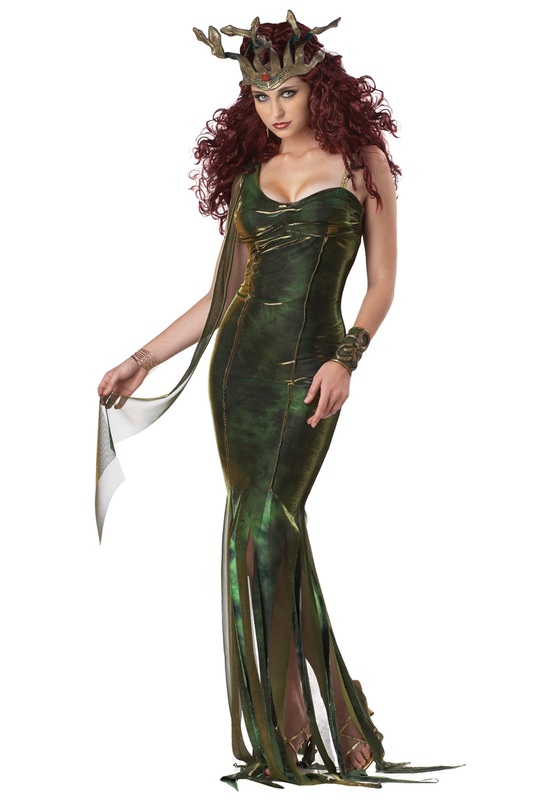 You could choose to try your hand at being a Gorgon with this Serpentine Goddess Costume. It's a fitted gown with metallic mesh overlay, a snake crown, and cuffs. You get to look whimsical anddangerous! Now we're talking! And although we can't promise any legendary powers with this outfit, just know you'll probably stop some people in their tracks.